Enthusiasm, joy and possibility create the pulse of Louisville’s campus life. The overall academic experience is enriched and supported by a vibrant program of extra-curricular and co-curricular activities. A wide variety of athletics, clubs, social events, ministry and service opportunities, assemblies and parent activities enlivens campus life and compliments academic programs. 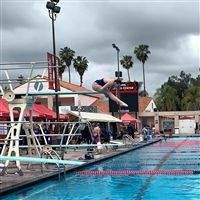 Pasadena, Calif. – Sophomore diver, Hayden Henderson, crowned Sunshine League champion Friday morning at the Rose Bowl Aquatics Center. 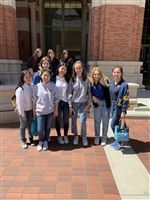 Last week, our Robotics Team & a few STEM Focus Program girls took a field trip to USC to learn about the ins and outs of Robots creation through drafting, design, and execution. The girls learned that there are many different aspects to creating Robots as well as them being used for different purposes and functionality. One of the highlights of the day was interacting with a Robot called “Denise” that looked and resembled EVE from WALL-E. Denise was able to follow you around and communicate through various sounds. Hopefully, future groups of Louisville girls can experience this fun day at USC. Focus Program Goes Behind the Scenes at the Zoo! On Saturday, March 30, four Focus Program students with an interest in animal and veterinary sciences spent the day shadowing alumna Elizabeth Cullip MacInnes ’03. Ellie is on the Animal Care Team at the Santa Barbara Zoo. She organized a VIP day for our students, giving them a taste of what it’s like to work with animals in a zoo setting... … read more! On February 28th, the Girl Up Club was able to experience life through another woman's eyes. Chizoba Uti, who works for International Medical Corp in Nigeria, came to talk to us about what life for girls in Nigeria is like. The shocking disparities between boys and girls causes girls to grow up without an education, as well as the inability to leave their homes without male supervision. These horrifying revelations made our club realize just how lucky we are to live in America, where we have the access to amazing schools. "I am so blessed to have spent these last four years at Louisville. I will never forget the lessons I have learned on ASB, sports teams and campus ministry, and I cherish the memories I have made. I will hold Louisville close to my heart and pray that God will continue to bless this special place."